"I will be back the next time I get in trouble!" I came to John Cryan Jewelry not knowing exactly what I wanted. His staff was exceptionally helpful and professional. They offer such a variety of styles and price ranges. My choice was easy and most importantly, she loved it! 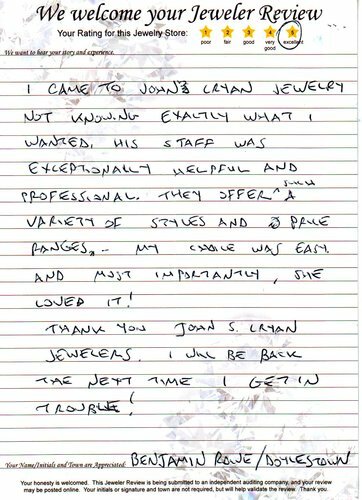 Thank you John S. Cryan Jewelers. I will be back the next time I get in trouble!